Of course, it seems silly to actually follow a set recipe for this type of a meal, as one of the things that makes these quick to make is not having a "real" recipe, where you would measure and have to have specific ingredients. Would love some feedback on this... Do you like to make it up with some basic guidelines, or a "real" recipe? 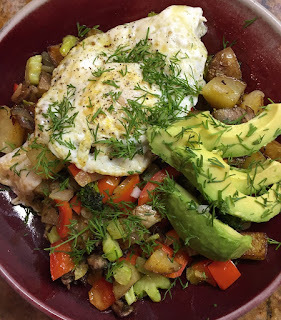 Potato hash has always been one of my favorites, but it didn't often make into the rotation, since you traditionally start with cooked potatoes (whole boiled potatoes), which I rarely happen to have in my refrigerator at 6pm when I want to make dinner. But then I stumbled across a shortcut in the Serious Eat Blog that really works: par-cook cubes of potatoes in the microwave. You just cube the potatoes, put them on a dinner plate, cook for a few minutes, then into the skillet. You can use any kind of potatoes. Russets are usually, recommended, but have been happy with red, gold, and even sweet potatoes. I even mix potatoes if I have a bunch of small ones. So, like the other dishes in this series, I am just giving some guidelines, not a "real" recipe. Feel free to improvise and adjust to your taste, and what you happen to have around! As to quantity, look at the amounts of each component to decide how much you want to eat. 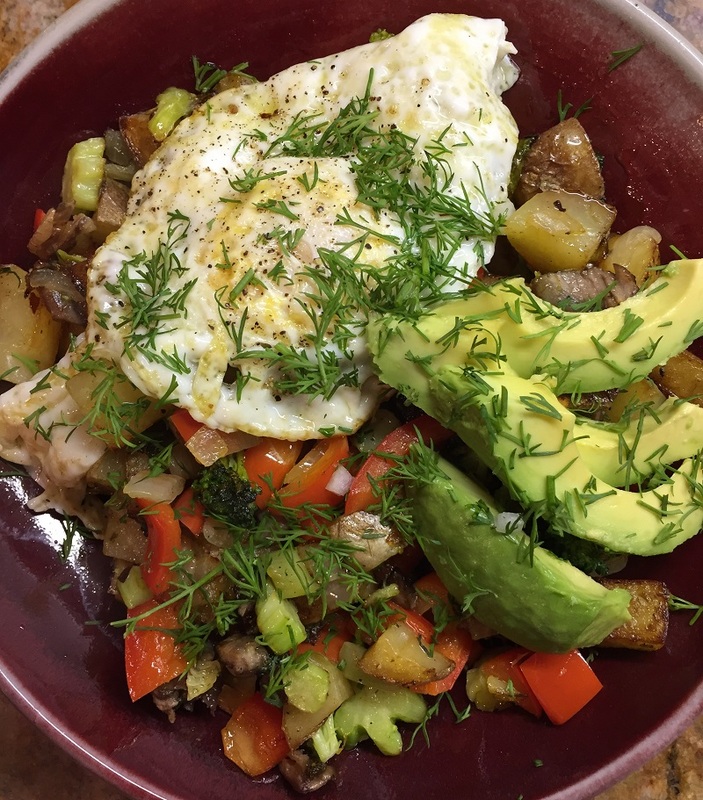 Double if cooking for two, adjusting plus or minus for how much they eat compared to you. I don't ever make this for more than two, since my skillet isn't big enough (I like to use a non-stick skillet, and the biggest one I have is 11 inches"). It does look like a big pile when you start, but it shrinks some when it cooks. 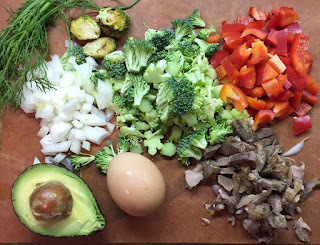 I like this best with broccoli or greens like swiss chard or kale, but use what you like. I do always use some onion (or a shallot, or green onions), and most always red bell pepper. Meat is optional. And last, I like to top this with something. Usually it's a fried egg (done in the same skillet, it just takes a couple of minutes after the hash is done), but sometimes shredded cheese, and/or a half an avocado. Chopped herbs will make it seem fancy. And ketchup is a traditional topping, although honestly I don't even have any in the house. So, here is a start, improvise to your taste! A good handful or two of a green vegetable or 2: Broccoli (small florets), or any kind of greens (kale, swiss chard, spinach), or diced zucchini. Leftover roasted or steamed veggies are OK. Optional: Bacon, ham, or leftover chicken, any kind of leftover grilled or roasted meat. Dice potatoes, place in a single layer on a plate, then microwave for 2-3 minutes per serving. They don’t need to be cooked through, but good and hot and have lost the raw crunch. Taste a cube to check. Careful – the plate can get hot. If using bacon, slice the bacon into half-inch pieces, then put into a 10 – 11” nonstick or cast iron skillet. Add a little water (a couple of tablespoons or so, this will keep it from spattering), and turn on medium-high heat. Cook until the bacon is crisp. Remove bacon and leave the grease. If not using bacon, heat a tablespoon or so of your favorite oil (enough to nicely coat the bottom of the pan) over medium-high heat. Add the potatoes to the hot skillet, sprinkle with a good shake salt, and a big grind of pepper. Shake, then let brown. If you are using mushrooms, add them now. 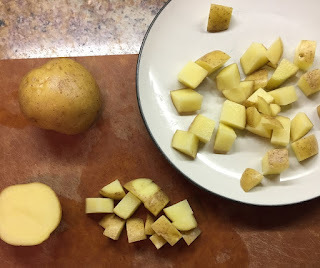 Once one side of the potato cubes are brown (this takes a five minutes or so), toss, then add the red pepper flakes, onions, bell peppers, and any longer cooking greens (like raw broccoli or zucchini). Just leave them on top to start cooking as the potatoes continue to brown. Toss again, now cooking/browning everything in earnest. Add study greens like kale at this point. When it’s almost done add any meat, sun dried tomatoes, or leftover veggies (just want to heat through, not really cook), and tender greens, like baby spinach. Add more salt and pepper to taste. Remove to serving plate(s) or a dinner bowl(s). If using an egg to top, add a bit more oil (or butter) to the pan, and quickly fry the egg. Add the egg to the top, along with other optional toppings – bacon, cheese, avocado, herbs, etc.